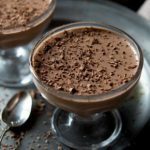 A rich, creamy and delicious Keto Chocolate Panna Cotta that can be topped with any of your favorite berries. This recipe makes a great keto dessert! In a large bowl, add 1/2 cup of almond milk and sprinkle the gelatin evenly over the milk. While that is soaking, add your coconut milk, almond milk, coffee granules, Swerve, cocoa powder and stevia to a sauce pan. Mix and bring to a simmer and turn off the heat. Add your hot mixture and the gelatin mixture to a blender and blend on high for a minute.